Writing theme has been well structured and has the most advanced and perfect HTML outline to make a friendly relationship between search engines and your website. Many ways to show your blog content. You have many options to show your blog posts, you can simply switch between blog styles (Default, Classic, List, Masonry) you choose the best way to show your content. Everything is Super Easy to setup. Not only has a simple design, but also everything is simple and very easy setup, you don?t need any skills to customize your blog, you only need to install the theme and you will get your blog ready. Great social engagement, you can show yourself. Your social profiles are your ID on the web, with Writing Wordpress theme you can show yourself on several social networks. 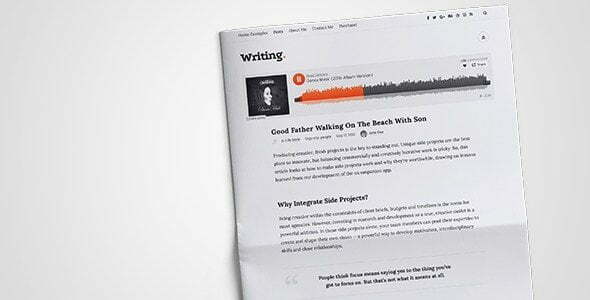 Your articles will have a good relation with social networks too, all pages are well built using Open Graph to look good when you share them on social networks.